One afternoon wayyy back in the first half of the 20th century my pal Hayden and I hiked home from high school via Griffith Park. Heading for the footbridge that still spans the mighty L.A. river we halted pronto at the bridle path, a horseman was passing by. I smiled, yelled Hi, and waved. His smile glowed. His Hi was deep, mellow, soft. He held his wave high as he continued down the trail. We stood fast and watched him go until he disappeared into the dust and dusk—Whispering Smith! Alan Ladd! I’ll never forget that moment, and I don’t think good buddy Hayden will either. Ladd was our hero. We tried to comb our hair just as he did. After a slugfest Ladd put his hair back in order with a quick brush of his hand. We had hat hair. We used stickum. 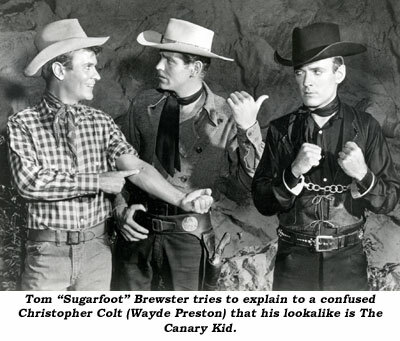 I swiped the idea on a “Sugarfoot” in which I also played the notorious Canary Kid (two roles, one salary). The Kid was about to kick his fallen foe in the head—a scream! Not from the heroine. ‘Twas the ABC-TV censor lady on the set—Kickus Interruptus—the Kid’s kick became a mere threat. I like fistfights in flicks more than gunfights. The stunt persons take over, and you get beautiful, exciting choreography. During Saturday afternoon serials of yore we kids yelled loudest during free-for-alls. We had some pretty good dust-ups on “Sugarfoot”. We all got our lumps. In one stirring episode I was having it out with a master of Savate, a guy who fights with his feet. I forgot to duck, and I got clipped pretty good on the chin. That guy could kick higher than a Rockette. In another saga I’m paired-off with Bear Hudkins (right). 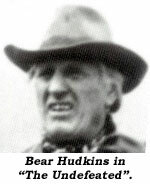 Bear was so tough he could single-handedly clear out a saloon of a Friday night if he had a mind to—they say! The director wants me to land an uppercut. Land it I do. Ay, Chihuahua! I break Bear’s nose. Blood on the sand. I say, “Come on Bear, my turn, let me have it. I got it comin’!” He doesn’t. I buy him a nice clock. On the card I write, “I hope this clock’s timing is better than mine.” The awful truth is the punch was left on the cutting room floor. I reckon boxing’s my favorite sport. Don’t much cotton to most boxing flicks. The actors look out of their element, every punch is a direct hit—Pow! Right on the kisser. By round three the fighters would be brain dead. “The Harder They Fall” is an exception, the fictionalized account of Primo Carnera, the Amblin’ Alp, and his tragic career. Mike Layne played him convincingly. In one bout he kills an out-of-shape pug. The way Pat Comiskey took the fall, to me, was a bench-mark in the history of fight flicks. Pat worked on a “Sugarfoot” (“Fernando”). He played the heavyweight champ of the world who loses his crown to a battling monk. The show looked expensive. We used stock footage from Errol Flynn’s “Gentleman Jim”. Pat was a brave man. He once fought Joe Louis. I told him he was so good in “The Harder They Fall” that I voted for him for an Oscar. He looked at me with watery eyes, his face a beat-up boxing glove. I don’t think he knew what the hey I was talking about. Worked with Kevin O’Morrison in Newark, acting in a recreation of a private eye radio show. He’s an ex-boxer. He told me the average Joe doesn’t know squat about the fight game. Kevin was sparring with welterweight champ Johnny Bratton one day. Johnny told Kevin to hit him as hard as he could. Kevin said he couldn’t rightly see his way to doing that. He, too, was a pro. Johnny said, “Un huh, take your best shot.” Reluctantly, Kevin wound up to deliver his Suzie Q. Johnny didn’t blink. He didn’t cover up. He gently pushed Kevin off balance. Time and again Kevin tried to land a solitoodie to the ol’ Cabeza. Time and again Johnny countered with his mystical technique, more martial arts than boxing. He only hurt Kevin’s pride. Kevin learned that day there was a whole lot more to the manly art than he ever dreamed of in his philosophy. So he took up another art, acting. 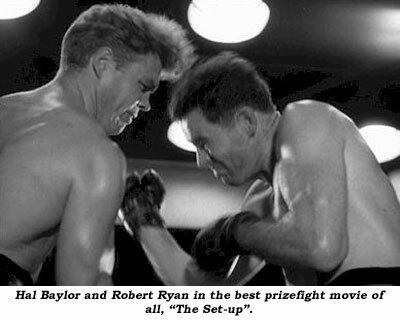 Kevin played a prelim fighter in that minor masterpiece, “The Set-Up”. Robert Ryan, a former boxer, gave the performance of his life as the washed-up tomato can with one great fight left in him. Against the odds and the smart money, he beats the brash young up-and-comer in a doozie of a fracas, much to the mob’s displeasure. 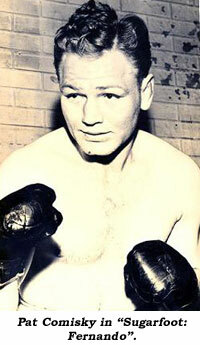 Ryan’s opponent was played by ex-California heavyweight champ Hal Fieberling, an up-and-comer actor. Hal didn’t give up his day job. He was a butcher at Beach’s Market in Atwater, and I worked in the produce department. Hal was a great lookin’ guy, unanimously appreciated by his lady customers. He appreciated the attention. He was an equal opportunity meat dispenser. We were pals. He told me about “The Set-Up”. He was proud that at the end of the shoot Robert Ryan had to go to the hospital for patch-up work—Hmmm! Somehow, that didn’t sound quite right to me. Hal told me he was a natural southpaw, but he fought in the orthodox right-hander’s stance, left carried low, inviting jabs and right crosses. When his opponent took the bait, Hal would come over with a thunderbolt left hook, often terminating the proceedings. Interestingly, his favorite photo of himself was not in victory but defeat. Out cold on the mat, victim of the new heavyweight champ of California, feller by the name of Turkey Thompson. On daze off we’d play golf out in Griffith Park. He’d bring along fellow actor Peter Coe, who played golf about on a par with me. He played shirtless. Hal told him, “Peter, if golf were muscles, you’d be champ.” Peter told wild and wonderful stories about working with Maria Montez in Arabian Nights flicks. Then I moved on to college. Hal un-plugged his meat slicer and moved up the ladder of success. Life plays funny tricks. Years later Hal guested on a “Sugarfoot”. He now called himself Hal Baylor. First day I moseyed up to him like the cat who swallowed the canary. “Howdy, Hal! Remember me? Beach’s Market? Golf with Peter Coe?” Pause—not a hint of recognition. “Hal, I’m your ol’ compadre Hutch—used to call you Feeb—Remember?” He changed the subject. Said he liked my horse—ambled off. Boy! I’ve heard of actors re-inventing themselves, but what did he do? Toss out all the old parts? At shoot’s end I bid him farewell. I said, “Keep punchin’”—Yep, Hollywood’s a strange game. Never quite got the hang of it.